Aerodynamicists use wind tunnels to test models of proposed aircraft and engine components. During a test, the model is placed in the test section of the tunnel and air is made to flow past the model. Various types of instrumentation are used during the test to determine the forces on the model and to better understand the movement of air around and through the model. Diagnostic testing to increase our understanding of flow phenomenon is the subject of this web page. Diagnostic instrumentation includes static pressure taps, total pressure rakes, laser Doppler velocimetry, laser sheets, and hot-wire velocity probes. A diagnostic test does not determine the forces on the aircaft, but helps the engineer to better understand how the fluid moves around and through the model. There are a variety of flow control devices that are employed to improve performance of the aircraft, if the local flow conditions are known. Depending on the type of instrumentation used in the experiment, steady state flow or unsteady, time-varying, flow information can be obtained. The engineer must use some experience when employing flow diagnostic instrumentation to properly place the instruments in regions of flow gradients or separations. On the slide, we see three examples of flow diagnostics used to determine the flow of air around a short take-off vertical landing (STOVL) aircraft model. During low speed flight near the ground, the exhaust from the jet engine is used to counteract the weight of the aircraft. But as the gas exhaust strikes the ground, it can be swept up and re-ingested through the aircraft inlet. The hot gas becomes a source of inlet distortion which can cause the engine to loose power. 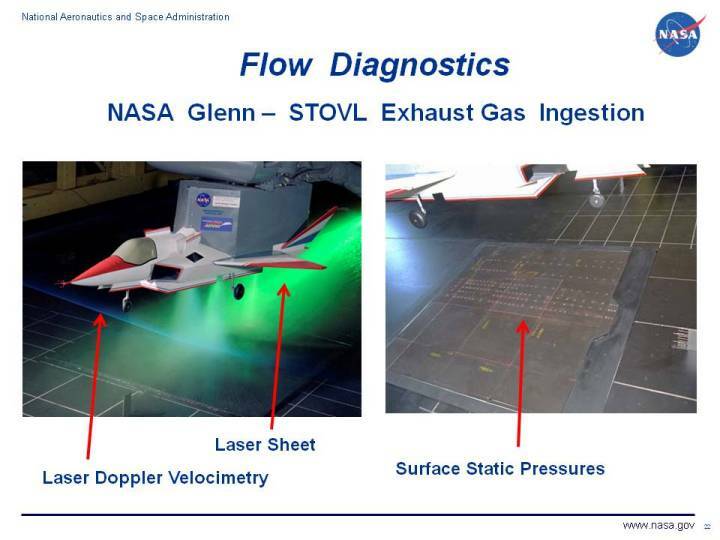 On the left of the figure we see a green laser sheet that is used to visualize the flow plume that forms between the jet exhausts. The blue beam from the left is part of a laser doppler system to measure the velocity of the plume. On the right of the figure we see a grid of static pressure taps on the tunnel floor to map the flow beneath the model. During the test, but not shown here, colored oil streaks were also used to determine flow directions. The tunnel was run at very low velocity to determine how local winds affects gas ingestion.